Each year, NSSA identifies Class All-American teams for their performance in the previous shooting year. This recognition program determines teams on an objective system based on numbers only. The first requirement for eligibility is that minimum registered targets must be shot: 800 12-gauge; 500 20-gauge, 28-gauge, and .410 bore; and 300 doubles targets. Selection will be based on HOA Class at the beginning of the shooting year. Krieghoff Open and Concurrent All-American Teams will be selected first, then Class All-Americans to prevent duplication. Even if you move up in class during the year, you will still be considered in your first regular classification. Members selected to the First Team will receive a Class All-American Team Pin and Patch, Recognition Certificate, and Letter of Congratulations. Second Team and Honorable Mention Members will receive the Class All-American pin and Recognition Certificate. All honorees will be listed in our Records Annual and in Clay Target Nation. Class All-American Teams provide more opportunity for NSSA to recognize individual shooter achievements. The recognition is based on points awarded for Class, High Gun and HOA 1st, 2nd and 3rd places which are calculated as shown below and updated regularly on this page so shooters know their standings in the race throughout the year. Calculation is objective, based on numbers only. The first requirement for eligibility is that minimum registered targets for all gauges must have been shot in order for a shooter to be considered for an award at year end. The minimum target requirement is: 800 12-gauge; 500 20-gauge, 28-gauge, and .410 bore; and 300 doubles targets. Targets must be shot at registered shoots or in registered leagues to count for this recognition. 100% of the maximum class points are awarded if there are 50 or more shooters participating in the class. 75% of the maximum class points are awarded if there are between 30 and 49 shooters participating in the class. 50% of the maximum class points are awarded if there are between 10 and 29 shooters participating in the class. 25% of the maximum class points are awarded if there are fewer than 10 shooters participating in the class. 100 % of the maximum points are awarded if there are 50 or more shooters participating in the gauge event or HOA. 75% of the maximum points are awarded if there are between 30 and 49 shooters participating in the gauge event or HOA. 50% of the maximum points are awarded if there are between 10 and 29 shooters participating in the gauge event or HOA. 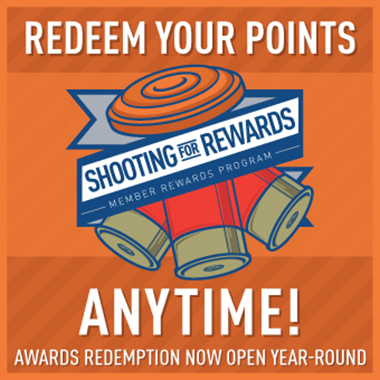 25% of the maximum points are awarded if there are fewer than 10 shooters participating in the gauge event or HOA. Selection will be based on HOA Class at the beginning of the shooting year. The calculation of the HOA for new shooters will be based on the first 5 events of the current year that are used to establish their classification in each of the 4 guns. Targets shot at these 5 events will also count towards the Class All American minimum target requirements. If you are selected for an Open All-American Team, you are not eligible for consideration. Selection for an All-American Concurrent Team is not a factor. You could be selected for both teams. League class places will count and be included at the end of the year. Monthly targets will not be considered. There is no additional administrative burden for our clubs. The computer will automatically assign points based on reported class and overall wins, 2nd and 3rd places. There is no need to travel away from your local area. You can shoot at your surrounding clubs and have an equal chance for consideration. Open All-American will be selected first, then Class All-Americans to insure there is no duplication. Watch your points accumulate on NSSA-NSCA.ORG and know where you stand after results are received at headquarters. The following teams will be selected in classes AAA-E for a total of 245 shooters each year. Honorable Mention Team – 15 shooters – Will receive pin and certificate. All will be listed in the annual Records Annual and in Clay Target Nation.